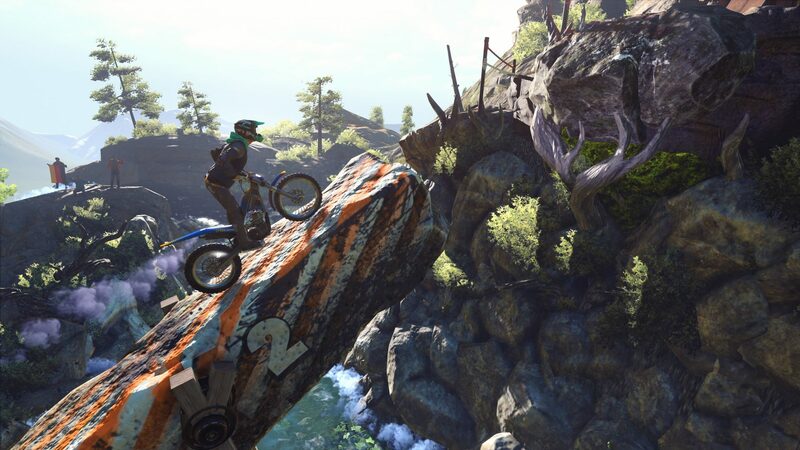 One of my less spoken about enjoyments in terms of gaming is the Trials series. 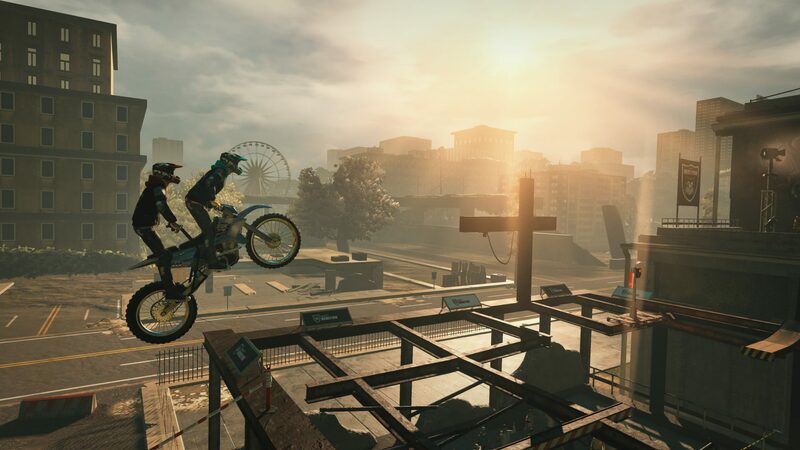 My first experience with the Trials franchise was with Trials HD on the Xbox 360, it wasn’t long after this first experience that Trials Evolution came out. This was the last time that I really played with Trials, though. I did play a little bit of Trials Fusion and I completely missed Trials of the Blood Dragon (which was the perfect way to make a sequel to Far Cry 3 Blood Dragon) and it always felt like I had other things to play when I got the chance to play these two, so when Trials Rising was announced I told myself that I would make time for it, as I was doing myself and the game a disservice by letting it slip by. Knowing this, when I was invited by the lovely folks over at Ubisoft Australia to come and play a preview build of Trials Rising I was certainly keen to get along. I also had the privilege of doing so alongside Professor Fatshady (Brad Hill), a Youtuber-turned-developer for the latest Trials game, with his channel University of Trials giving him an avenue to turn small little tips and guide videos into a fully-fledged tutorial for a Trials game. 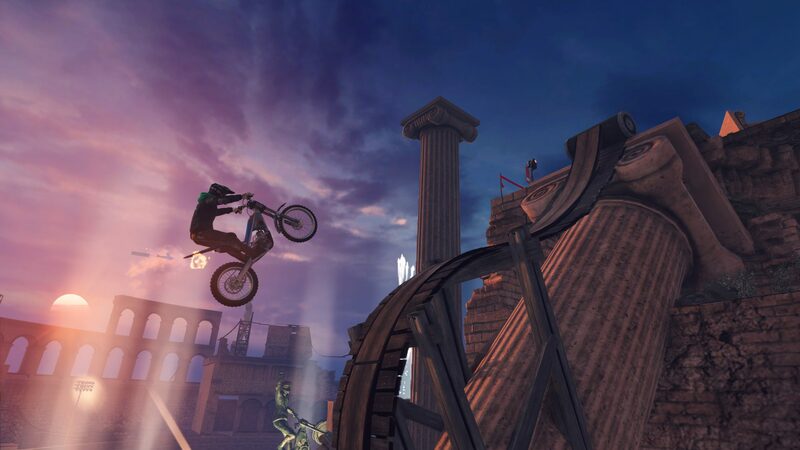 So Trials Rising sees the introduction of a few things which will be detailed, but we will start with the basics. Trials Rising really makes an attempt to make sure that lesser experienced players are taught the various techniques and skills to progress through the game, whether it be from simple leaning to pivoting and bunnyhopping your bike to get the right balance, Brad Hill has lovingly created tutorials that are not overwhelming or intrusive and only come up when the skills would be pertinent for a newer player (experienced players can very easily skip these tutorials). Even though I was still fairly familiar with all these tricks and skills, I sat through the tutorials anyway to get a gauge on how helpful and informative each of these were. “I’ve been able to put a huge amount of thought, a lot of stuff that no one would ever see, into even just thinking out how to go about teaching these skills. Do I just pick each track and just teach people how to be able to do that track? And then I thought ‘well, no’ because there are too many tracks for me to teach each one,” says Brad Hill. The idea behind a lot of the design and writing for Hill’s tutorials was to focus on a specific skill or skill set which would better equip a player for what’s to come, and rather than to just have a bloated and long tutorial stage, the tutorial is broken up into segments throughout the entirety of the game because learning an advanced skill and not using it for hours until you hit a later stage is a waste of your time. What we got back to was just these core techniques. We tried to find the smallest number, because you don’t want to inundate the player with videos because then you run the risk of people not watching them. So how we boil all of this complexity and all of this nuance to the smallest amount of chunks that are going to be usable, practical and actually worthwhile including in a game like this? Now something that I have noticed with previous Trials titles is that the pacing of the games’ challenges was not always the most steady. For a game like Dark Souls or Hollow Knight this is okay, as there will be regular points where the game tests your skillset with a difficulty wall. 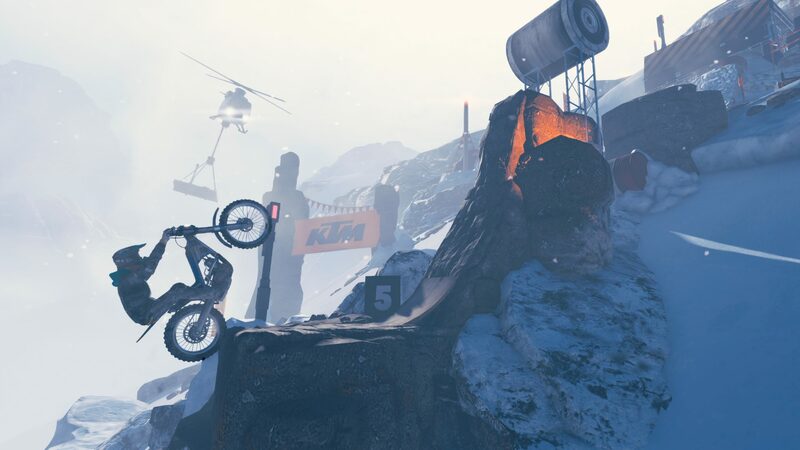 Trials is not one of those games, however, and so a difficulty curve has to be as consistent and smooth as possible, as a ludicrously tough stage in the middle of medium-level tracks is not very indicative of what is next. Not to say that the difficulty curve in previous games was terrible, just not as consistent as I’d like for it to be. Trials Rising changes this, with some very consistent difficulty curves that never feel like a challenge is teetering on the edge of unreasonable. This is due in part to the placing of Hill’s tutorials which not only teach the player how to progress, but also make sure you actually understand what you are doing. There will be some techniques that you struggle with, but the pace at which you need them is steady. However, giving Hill and his work full credit for the better difficulty curve would be unfair to the people at RedLynx who also pivoted their design to allow for a more consistent experience. When asked about how his tutorials helped with the pacing and flow of the game’s difficulty, Hill stated, “That’s the intent, but it’s not just that. Tutorials by themselves are not going to fix that problem so there has also been a lot of work both from myself (through feedback) and the team themselves.” I was able to point out ‘hey this track might be rated for medium difficulty, but there is this one obstacle that requires this much more advanced technique or skill. Since we are on the subject of difficulty, one of the more notorious things that Trials is known for is some of its extreme tracks, like the Inferno tracks back in the day. In the build that I played, there was only one extreme track available. Naturally I went straight for it and used the Helium (the BMX bike) to complete it. I was curious to see if there was going to be a line of tracks within the extreme difficulty that would potentially gain notoriety like the Inferno tracks and I asked Hill he stated that the tracks available in the preview build that we played were the only tracks that were publicly released in terms of info, so I guess we’ll just have to wait and see. Due to the way it has been designed, if a track is impossible with the Tandem bike, it will not be available for selection when you choose your bike for a track. A great example of this is how with the extreme track that was available, the Tandem bike was not permitted as the track would have been impossible to complete with it. “The interesting thing to me is going to be the community tracks that you play on the Tandem because the community has the tools that the developers have in the level editor. Trials has this interesting thing where the developer will limit things to what they think is possible and the community will blast through that and do stuff that they never could have imagined.” What’s really cool with the Tandem bike, however, is that the simplicity of its design also lends itself well to potential expansion on the idea, so something like a Tandem Donkey (the mini bike) may not be so ridiculous, however any comment on this is purely conjecture and talk of such thing has not really made its way through the RedLynx offices. “If that ever happened I would be very happy with that. There is a bit of a balancing act, though. You want to make sure that it doesn’t take away from or provide an unfair advantage to the stuff that is there. You have to be careful when designing these things so you don’t inadvertently break the core of the game. Competition is so important and if they released a bike that was suddenly so overpowered that everybody won with it, it would take away from it so I think you have to be careful when doing those things. But if you are able to add these things without taking away from what the core of the game is, I’d take everyone that you could bring,” Hill explained in regards to the potential for variations on the Tandem bikes. The level editor and community created content are more or less at the heart of the Trials games. Whilst the creations that the developers themselves come up with, Hill himself stated earlier that “the community will blast through it and do stuff that they would have never imagined,” and this is something that rings so very true about Trials. I remember when I was much younger watching Achievement Hunter doing their Trials Files videos and being completely blown away with some of the maps and tracks created by the community. Seriously, the amount of love and care that people put into their tracks was astounding, and RedLynx’s open-arms embrace to the community creating such incredible things was one of the best things I had seen in a while. So it would make sense if the developer had made sure that their next version of the level editor was the best yet. Now the only level editors I really got into were the Halo Forge mode(s). I always tried to get into the Trials level editor but I just sucked at it too much. However, this latest iteration on the level editor is one of my favourite yet and I can definitely see myself spending time creating tracks when the full game releases. RedLynx have done an incredible thing and included all the assets from the previous games (HD, Evolution, Rising, and Blood Dragon), which means that the possibilities are virtually endless. There are over 8000 items to use and they are neatly ordered so you can easily remember where they are, once you have familiarised yourself with the layout of the UI and everything. When (very excitedly) discussing the level editor within Trials Rising, Hill had this to say, “All the items from the previous games and some new ones exclusive to Rising itself are all available within the game and for a lot them, they are colourisable and scalable as well. So when you put all of that together, there’s a huge amount of variety that the community is going to have. And just to be clear, these are the same tools that the developers themselves have built the entire game with.” It’s this last point that is a really cool thing to hear. The fact that the developers have been opening up the same tools that they use to the community when it comes to building tracks shows the level of trust and love that RedLynx have for the Trials community. I can’t wait to see people recreating the really popular Trials tracks with the right assets so we can relive those tracks. The last thing I got to check out was how the game handled on the Nintendo Switch. Being the first entry for the series on the Switch, it was very important to make sure that this version handled as best as possible. Naturally, the resolution is lower which is especially noticeable when using the docked mode, but the major difference is the shift in controller mapping for the Switch. The Switch has this interesting design where the triggers are a digital input rather than an analogue input, meaning that it’s either on or off. While this could be a major problem for some, RedLynx had the foresight to add the ability to throttle or brake using the right analogue stick. Pushing the stick either up or to the right (or anything in between) will send the player forward, pushing the stick down or the left will apply the brakes. Hill went on to explain how console players are juggling between analogue and digital input and some players opt to use the face buttons, which are digital input, for their acceleration. There will more than likely be a bit of a learning curve with it, but playing with the Switch is very manageable, I even managed to beat the extreme track on the Switch as well as the PS4. The other difference with the Switch version is that the game runs a little differently. When questioned about the technical performance of the game, Hill explained to me that whilst most of what you see runs at 30 frames per second, the really important stuff like the physics calculation actually runs at 60 frames per second, which is a great choice as it allows for the most consistent experience across different platforms. All-in-all, Trials Fusion is turning out great and I cannot wait to get my hands on with the full game when it releases on February 26th. I cannot thank Ubisoft and Brad Hill (Professor Fatshady) enough for allowing me to come and try out this game and I hope that the community thinks as highly of it as I already do.